For the next 30 days I will put up a project a day for Christmas. Stampin' Up head office. I thought this was a great idea. and how about a coordinating card. Keep Christmas simple and stress free with easy gift wrapping ideas. Stampin Up! 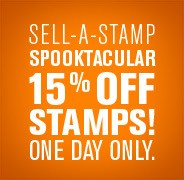 has just announced an incredible one-day only never-been-done-before savings event--the one-day Sell-A-Stamp Spooktacular! There is no minimum purchase, and no limit to the number of stamps you can order. So, take a look through our catalog and let me know which sets you need for Holiday projects, or any sets that have been on your wish list. Now's the time to order them! I will be hitting send on the order at 10pm this evening. Give me a call at 519-209-4961 or shoot me off an email as soon as you've decided the stamp(s) you've just got to add to your collection. You can also shop online at www.denisedonald.stampinup.net or www.craftdbear.com. As an added bonus: Everyone who places an order by 10pm tonight will be added into a special draw for a chance to win one of two $25 gift certificates. Winners will be announced on November 1st on my blog. November 1st will also kick off my "30 Days of Christmas" on my blog featuring a different Christmas craft everyday for 30 days.